Over the last few years, I’ve received dozens of requests from companies and individuals who want me to promote or sell their iPad apps or accessories. I’ve chosen to write about only a few that I believed were quality products from reputable companies. Several weeks ago, the founder of a company called ZooGue contacted me. I decided to do a bit of research, checking on the company and the person behind it. Founder Tim Angel overcame a number of challenges while launching his products and building his company. I was intrigued by his story and impressed with the video showing how his iPad notebook style case was better than any other. (But please don’t punch your iPad for having a bad case). Tim sent me the folio style iPad Air Prodigy Elite model to test. I’ve been using it for the past several weeks at home and on the road as I visit family, friends and clients. I’ve used and tried a number of folio style iPad cases for my various iPad models. For me, this is the best iPad case ever. Update: 6 months later and I’m still happy with my Zoogue case. Got one for my wife too! What sets the Prodigy Elite apart from every other case I’ve tried is the stable and secure magnetic kickstand. You can see the kickstand in the photo at the top of this article or see it in action in the video. The kickstand system does add a little weight, but the benefit of seven stable viewing angles far outweighs (intended pun) any concerns about the extra ounces. 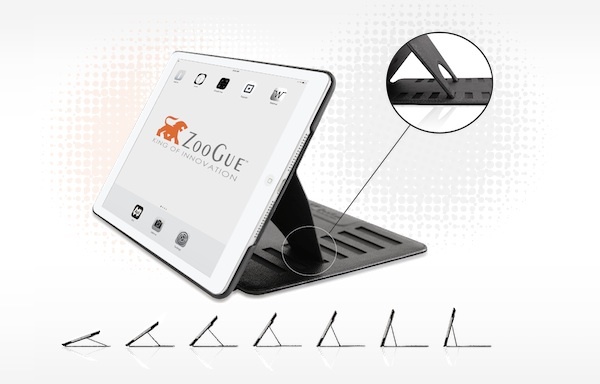 The iPad Prodigy Elite covers and protects the entire iPad when closed. It features a magnetic sleep/wake function, corner edge protection and custom cutouts for ports, buttons, the camera and speakers. I liked the Prodigy Elite case so much that I arranged with Tim to sell it for a discount of 15%. Simply use the coupon code ACADEMYAB when you check out. Tim also sells a Prodigy Elite model for other iPad models. Use the same coupon code when ordering to save 15%.